← What does your ring shape say about you? 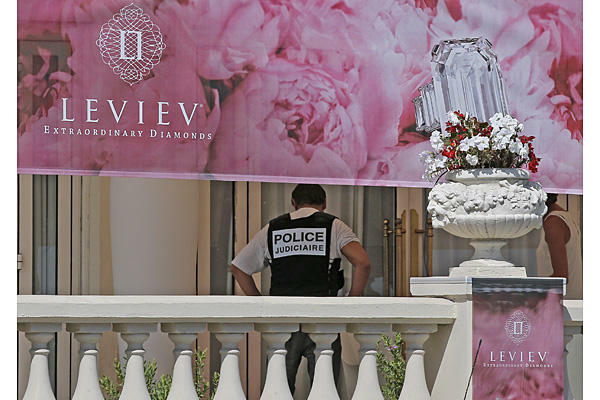 The robber of the largest jewelry heist in France, as well as the $136 million dollars worth of jewelry he stole, still have not been found. They have released photos of all the jewelry pieces to the public. One robber, ran into the lobby of the Carlton Intercontinental Hotel and left in less than a minute with an estimated $136 million dollars worth of jewelry items. The jewelry was an exhibition of pieces from the Leviev diamond company, which is owned by billionaire diamond and jewelry collector, Lev Leviev. Jewelry reports have estimated around 72 pieces (including rings, pendants and earrings) were stolen, with 34 items considered “exceptional.” The thief lost some of the jewelry while fleeing the scene. Below are images of some of the collection that were stolen. 3.27 Trapezoid-shaped diamond, a 1.02-carat vivid yellow trapezoid diamond and a 1.59-shield-shaped diamond with emerald and diamond beads throughout (110.00ctw). 55.38-carat flawless emerald-cut diamond flanked by two tapered baguette diamonds mounted on platinum. 14 oval sapphires (18.01ctw), eight marquise-shaped diamonds (4.64ctw), carre-cut diamonds (3.81ctw), round brilliant diamonds (3.90ctw) on platinum and 18k white gold. The rare-colored 13.22-carat diamond is flanked by two bullet-cut diamonds and set in 18k yellow gold and platinum. 11.62-Carat D internally flawless diamond in platinum. 10.02-carat emerald-cut diamond ring with two diamond trapezoids mounted on platinum. 45 marquise-shaped diamonds (17.25ctw), 44 oval-shaped sapphires (37.04ctw) accented by round brilliant and banquette diamonds set in platinum. 10.25-carat and 10.05 pear-shaped diamonds with 3.22-carat and 3.17-carat pear shaped diamonds, accented by round brilliant-cut diamonds in platinum. 7.14-carat intense pink radiant-cut diamond is flanked by two shield-cut diamonds (1.49ctw) and mounted on platinum and 18k rose gold. The diamonds used to create this piece include: A 6.52-carat pear shaped radiant drop, 15 radiant-cut fancy, vivid yellow diamonds (12.38ctw), with oval, pear-shaped and marquises (37.73ctw), accented with 12 baguettes (0.23ctw) mounted on platinum and yellow gold. 5.85-carat fancy light blue diamond accented by 10 pear-shaped diamonds (5.96ctw) mounted on platinum. Two radiant-cut fancy yellow diamonds (15.49 carats and 15.27 carats) beneath two radiant-cut internally flawless fancy yellow diamonds (3.22ctw) accented by yellow melee and set on 18k yellow gold. Platinum ring with 22.28-carat square emerald cut diamond, accented by 2 tapered diamond baguettes. 14.07-carat fancy yellow diamond is flanked by two tapered baguette diamonds (0.90tcw) and mounted on platinum and 18k yellow gold. 23 pear-shaped diamonds (14.18ctw) 128 round brilliant diamonds (28.65ctw) set in platinum. This platinum brooch is set with 18 pear-shaped diamonds (30.90ctw). The large emerald on this platinum ring is flanked by two shield-cut diamonds (1.42ctw). 41 square emerald-cut diamonds (73.64ctw) set in platinum. 30.15-carat pear-shaped diamond accented by diamond melee and on a platinum setting. 11.4-carat fancy, intense, blue, oval diamond surrounded by pink and colorless melee set on platinum and 18k rose gold. 6.17-carat oval-shaped light-pink diamond surrounded by diamond melee and set on 18k pink gold and platinum. 71.73-carat, cushioned-cut diamond with yellow and colorless melee in 18k yellow gold and platinum. Oval sapphires (2.71ctw) surrounded by brilliant cut diamonds (1.92ctw) and 48 round sapphires (1.53ctw) set on platinum and 18k white gold. 7.06 carats oval-shaped fancy yellow diamond with yellow melee mounted on 18k yellow gold. The large yellow diamond is accented by round brilliant colorless diamonds and set in platinum and 18k yellow gold. 5.29-carat fancy pear-shaped diamond with a colorless 0.74 cushion-shaped diamond, accented with yellow and colorless round brilliant diamonds set in platinum. 10.11-carat cushioned shaped diamond set on platinum and enhanced with round brilliant diamonds (1.05ctw). This entry was posted in Diamonds, Jewelry News and tagged french jewelry heist, jewelry stolen, jewelry stolen in france, jewelry warehouse. Bookmark the permalink.